Here we go!!!! 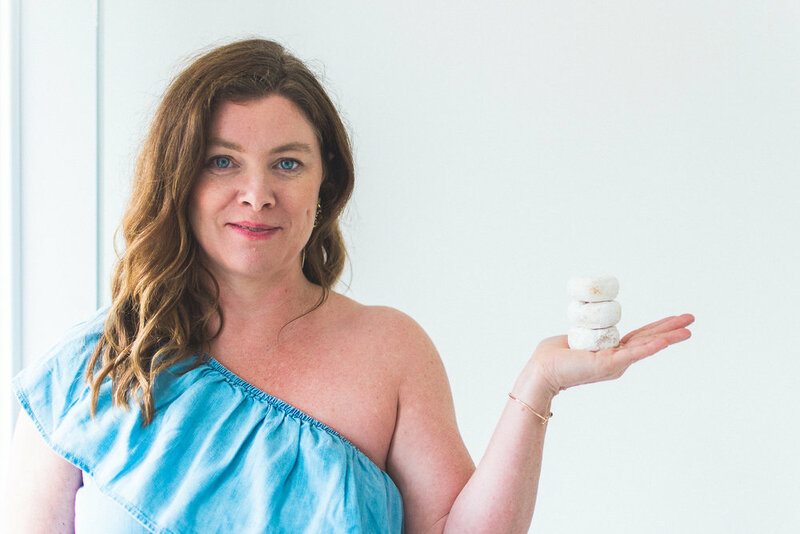 A 10 day crash course in Intuitive Eating...to be followed by LOTS of work learning to really, deeply connect with our Inner Authentic Intuitive voice! 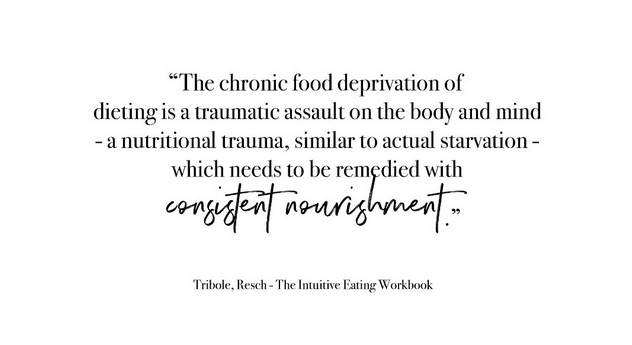 Based on the work of Evelyn Tribole and Elyse Resch, we're going to cover all of the tenets of Intuitive eating in bite sized pieces, from my perspective. Think of it as the Coles Notes of Intuitive Eating .....I'm going to make sure you have all the most important, action oriented, highlight-able bits, so that in the end - while I can't promise you'll be an intuitive eating expert - you should be able to fool your high school health teacher into thinking you actually read the book. Know that you don't have to go through the 10 concepts of Intuitive Eating day by day - you can pick and choose concepts that are the hardest for you (especially if you are familiar with the concepts) and dig deeper into those OR skim through all the concepts and then use the meditative practice as the foundation for your week. Those are just a few ideas....the main thing is: don't get overwhelmed! Use the info as it fits into your life WHILE working to increase the connection you have with your intuition and your ability to make food choices that are flexible and best for YOU!!!! It's day one and you've opened this first post! Hooray!!!! Today we are gonna have a quick chat about dieting and why it's ruining your life (all drama intended). Until you get out of diet mentality it will be darn near impossible to eat intuitively because, as I yelled in my welcome email, dieting DISCONNECTS you from your body - and Intuitive Eating REQUIRES that you connect with your body and trust the information you receive. How do you go from pretending your body is a programmable fembot that you can just set to "Paleo" or "low fat" or "liquids only"...... to understanding that you are a real-life human woman with changeable needs? You start by identifying the problem. And that problem, my friend, is called DIETING. it is the belief that you can and should be using food to control your weight and/or health. Within the mindset you are either good (when you're on the program) OR bad (when you aren't). You're on the wagon/off the wagon, in control/out of control, healthy/unhealthy. It's an all or nothing ghost town and you need to catch the first bus OUTTA THERE. This mindset isn't just about Jenny Craig, or Weight Watchers, or The Zone....it can be applied to any form of eating - even those plans/ideals touted as "healthy lifestyle changes". Even if only for the 10 days of this crash course...there is no more good or bad, right or wrong, there is only what you feel in your body. We are fearless explorers in the country of Switzerland where all is neutral and the cheese is good. In order to really reject diet mentality you are going to have to understand (and try to absorb) the fact that DIETS DON'T WORK. As long as you believe that every morsel of food you put in your mouth dictates your weight, you will not be able to stop this mentality and start eating intuitively. You just can't. I don't have time to get into all of the science in this crash course but know this: Diet's fail for 90-95% of people, long term. That is the ONLY thing we know for sure about dieting. Diets fail for a reason: hyper-controlling food breaks your internal thermostat (the mechanism that regulates your weight and appetite effortlessly) and, at the end of a diet, most women are left completely disconnected from their bodies with a HIGHER SET POINT and an appetite/cravings that feel out of control. This is the damage of dieting. Did you hear that, missy??? Shall I scream it into your good ear? If you keep dieting your weight WILL GO UP and you will feel increasingly out of control. Make a VOW to stop dieting. To stop reading books and magazines and listening to friends tell you how you should eat. Commit to figuring out what YOUR body wants and needs. Feel free to get a bit mad about the lies you've been sold - after all - you'd never be in this place with food if you hadn't been TAUGHT to diet. Be on the lookout for DIET MENTALITY. The idea here is that you start to recognize how much of your day is spent in a battle with food and your body. SO many women think that they "don't diet" because they aren't on South Beach or Atkins...but diet mentality reaches so much further into our food habits than just a specific plan. Watch for thoughts around food control: when you should/shouldn't eat, how much you should/shouldn't eat, trying to compensate for eating with excessive exercise or more food control. Comparing and competing with the food intake of those around you. Write your thoughts down and start to challenge those thoughts. Can't wait to see your AHAs! and your OhNOs!!! Come on over to our Facebook Page to share!!! Day 2, here we go.....but first: how was yesterday? Anything surprising? Did you realize how much of your day you spent trying to control food or apply food rules to the way you eat? The second tenet of Intuitive Eating is a really important one. Learning to consistently attend to feelings of hunger is the first big step in repairing the damage dieting has caused. I want you to think of a small child (or animal). And I want you to imagine that that child has not been fed consistently. That there have been periods of food deprivation, a failure to respond to her hunger, the child asks for something she wants or needs but she's told no. When she has fun with food at a party - she's berated. Every bite of cake, she gets punished. She's never sure when the next period of food deprivation or criticism will come, when sugar or pasta or fruit will be allowed again. Now, how do you think this child will behave when left alone with food? When she's given full permission to actually eat? My bet is on the fact that that child will gorge herself. Hunger is a biological drive. A drive to keep us alive and when there is food uncertainty - whether out of our control or self-imposed - our biology responds by increasing our drive for food. We not only get hungrier but we crave more nutrient dense foods (think fat and sugar). No amount of willpower can (or should!) be able to overcome this drive. If your appetite feels out of control there is a reason....your body does not feel sure that you will feed it consistently. That "small child" inside of you does not trust you and so she will continue to ask and ask and ask and ask for food - in preparation for the moment when the food stops. For that small child - this is survival. How do you get her back onside? You regain her trust. You FEED her. You listen to her requests and you respond. Over and over and over again until she settles down. Take note: I haven't mentioned responding to FULLNESS yet. Because our desire for food is a biological drive, when there is food uncertainty there are ALL the reasons to stay searching for (and eating!) food and virtually no impetus to STOP eating. It's very, very difficult to respond to feelings of full until your body trusts that it will be fed consistently. Now, I promised that this would be a funny course and I realize that conjuring up images of child neglect is not exactly hilarious. I considered inserting a poop emoji here just to lighten the mood but, for just a moment, I want to take a break from the jokes and actually get you to consider what you are doing to your body when you are restrictive. You wouldn't do it to a kid or a friend or even an animal. I'd like you to stop doing it to YOU. Because of the "Diet Disconnection" (that's what I'm calling it now - it's exactly like the Rainbow Connection but opposite and awful!) most women don't even know what hungry feels like. Start by trying to guage your hunger on a scale of 0-10, randomly throughout the day. 10 = starving, low blood sugar, hangry. TRY to feed yourself consistently when you are between 5-8. Day 3 - Make Peace with Food! Day three and you're still with me! Well done. I've had many a woman cry when I suggest it. But first, how was yesterday? Have you gotten better at rating your hunger? Have you started attending to it? Not to worry if it was hard. That's normal. Ignoring biological needs is something most women are actually really good at. Changing those patterns will take time. Beyonce wasn't built in a day, my friends. You are going to pick the food you most avoid, are fearful of, out of control around, etc. and you are going to EAT THAT FOOD. In an ideal world, you wouldn't just do it for a day or with just one food....you'd make a list of foods that pull you in with magnetic force and then you would slowly, systematically work your way through those foods one by one until they had NO MORE POWER OVER YOU. In order to be able to listen to your body and respond to her needs, you need to neutralize food. As long as you have Twizzlers on some sort of sordid, bedazzled pedestal - when faced with the option between the two, the strawberry flavoured twist will always have more pull than the strawberry. We need to take the pull away. The only power it has is the power you give it. Well, my little Chiquita banana, it's time to take the power back. Decide on the food you are going to legalize. If you can't figure it out, make a list of all the foods that catch your attention over the course of a few days. Cross off all the foods you easily allow into your diet. CIRCLE the foods you are terrified of (ie do not allow). Pick one of the foods you circled. Go out and buy that food. Not just a little bite of it, buy a lot. Have it all around you, readily available. Eat the food as many times a day as you desire. Sit, take a few breaths, and eat as much of the food as you like. Chew it. Really taste it. Now think about it, just for a few minutes. How was it? Did it taste as good as you imagined? Did you eat enough of it? Too much? How did it feel in your body? Let it go. Move on. Do it again. This is all one big experiment, keep gathering data. Do the exercise outlined above. That's it! I realize that for many women that exercise reads like the screenplay of Alfred Hitchcock's The Birds but remember - BIRDS ARE TERRIFYING!!! Today I'm going to teach you how to deal with the interminable voices in your head...the ones that beat you up, force you to follow made-up rules, and - occasionally - encourage you to throw all caution to the wind and eat an entire cake, when one slice would have been great. But first! How was yesterday? Did you make eternal peace with food? Are you the Buddha of breakfast, lunch, and dinner? The Dalai Lama of dessert? oh, thank god, if it was that easy I'd be out of a job. Sh*t. Did I say that out loud? Oops! I just swore. Double sh*t.
Seriously though, making peace with food is a really long and tough part of this process. It's perfectly normal for it to take months. Were you able to eat ANYTHING normally on your no-no list? If so, that's a win. The deprogramming that needs to happen in order to repair your relationship with food can be epic. It's important to celebrate all the baby steps along the way....so, pat on the back. As the fabulous Brene Brown (and Teddy Roosevelt:) would say "you're in the arena". And for that you should be proud. You gather these rules from all over the place: books, magazines, tv and movies, your friends, your teachers, your doctors..the list goes on. You hang on to small snippets of the nutritional information you absorb (often our of context) and these beliefs become so deeply ingrained that, even in the face of TONS of information to refute these rules, your brain wants hang on to them. Your brain will live and die by the rules it thinks will make you thinner and morally superior. These rules dictate when you are GOOD (you ate under 1200 calories today! yay!) or BAD (you ate something with sugar in it! Boo.). These rules are often VERY difficult to live by in a human body that is ever changing with demanding lives that are also constantly changing - and so typically, at some point, you have to break your own rules and you are left feeling BAD. Like YOU screwed up. You Failed. Like you have no will power. Salad dressing makes you fat. Everything in life makes you fat. LIVE IN FEAR!!! What if it's NOT US failing the rules but the rules failing us??? These rules are often unfounded, contradictory, changeable, and CONFUSING. Raise your hand if the science of nutrition ever feels CONFUSING. Not only that but when you feel BAD what do you do? Do you take BETTER care of yourself? You say "what the hell? I've already messed up today! Might as well keep going....."
And then you eat everything in your fridge, including the expired condiments. While we can learn from the science of nutrition, our best teacher is our body. As long as there are food experts out there, they will disagree about.......well, everything. We need to be able to make decisions that make sense for OUR bodies and OUR lives. You need to be your own expert. And, in order to do that, you need to silence the food police in your head because (they are insane and) they are drowning out important information from your body. How do you fight the food police in your head? Think of this as a living, breathing meditation (that you are actually going to do). It would be unreasonable to think you could go from living with very specific, incessant, food rules uni-cycling through your brain like a one-man-band for most of your life, to a silent, peaceful brain. It's not gonna to happen. Instead, what you are going to do is notice every time you find yourself feeling like you need to follow a food rule. A rule that makes you feel good or bad. And then you are going to write it down. And then you are going to challenge that rule. 1. The Food Anthropologist: this voice isn't trying to make any changes. It just observes what is happening. It observes that when you ignore your hunger at 10:30 am, you overeat for the rest of the day. It notices that when you have a stressful day, you eat sugar at night. It notices that when you eat consistently your energy and mood are better. It just notices. It's not trying to make big shifts - it's just gathering data. 2. The Nurturer: think of this as the voice of your grandma or a well-paid shrink. This voice is there to normalize your behaviours. When you overeat at the end of the day this voice says - " no big deal - that's normal, it's a perfectly reasonable way to cope. You're figuring this out!". When you eat cake for breakfast this voice says "okay, interesting choice! You must be needing some extra love today". This voice is NICE. It'll probably feel kind of lame-o to be nice to yourself but hey - how far has shaming and criticizing gotten you, thus far? Did you start to really hear those voices in your head - the negative, know-it-all, judgemental ones? Were you able to keep your cool? To enter the (kind of boring) drama-free zone called BEING NEUTRAL? It's a lot less of a roller coaster, huh? *take note if you find yourself missing the drama - you might be a bit of diet addict (which is a term I sort of made up but it's way more common than you think). I can write/talk more about that another time!!! You are stressed out or emotional: when you are in a place of high-stress/high-emotion your body is not primed to digest. In fact, you will likely be quite numb to the taste and pleasure of the food you are eating. It's actually possible, and quite effective (! ), to USE food to take you from the state of fight or flight (the stress response) into the state of rest and digest (relaxation). There is a reason it's so tempting to overeat when stressed - it works! If you eat enough you'll notice that you start to feel tired, lethargic, and lazy. Congrats! You're relaxed! Unfortunately, you probably also over-ate. You eat like the Tasmanian devil after a marathon: When you eat really fast, your brain has no time to check in with your body. It takes awhile to register how full you really are and when you eat super speedy fast, you'll find yourself stuffed before you know it. You aren't paying any attention: You likely spend the better part of the day thinking about food and then, the moment food is in front of you, you zone out. You look at your phone, read a book, watch tv, etc. Our brain needs to pay attention to food in order to register that eating is happening. Eating while distracted is kind of like having a conversation with a friend that doesn't listen to you at all.....when it's over you're left feeling kind of empty and like you want to do it again (with someone new and better, obviously). 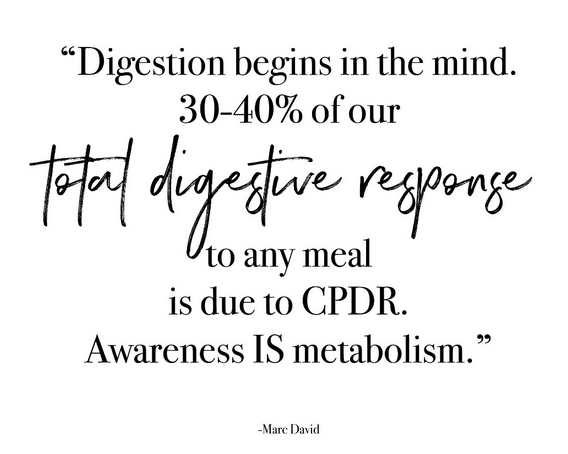 Cephalic Phase Digestive Response (CPDR) is dork for: the importance the brain plays in how we digest and assimilate food...and it's HUGE. Your brain needs to be IN THE GAME. The biggest obstacle in all three of the scenarios above is not being present. You need to be awake at the plate. 1. Before you eat, take a few breaths. Look at the food in front of you. Really take it in. Smell it. Say a small "thank you" (access to food is not a given, it's a privilege AND DON'T YOU FORGET IT). 2. Eat some of your food. CHEW IT. Part way through, when you remember (or set a timer), put your fork down again and breathe. If you're starting to feel full, stop for a few minutes. Take 4-5 more breaths. Decide if you want to keep going. You can start again ANY TIME. Repeat until you feel full. 3. For those who really struggle with leaving food on their plate, here is what I suggest: eat until you feel think you maybe, might be, full. Set your plate aside, maybe in the kitchen, but don't get rid of it. If, in 10 minutes, you are still hungry have a bit more. Continue until you feel done. If you end up eating it all - NBD. You took the time to evaluate your fullness and you learn something new about "how full feels" every time you stop and pay attention. Well done. If you are at a restaurant do the same. When you feel done, take the rest home. Even if it's just a few bites. Sometimes just giving yourself permission to take the rest home provides you with the space you need to recognize that you are actually full. And if not, you can always finish it!! No rules!!! Okay folks! Day 5 is done. We are half way there!! When I was little my uncle taught one of my sisters to make the sound "mmmmmmmmm" the whole time she was eating something, if it was really good. My sister LOVED food and I've diagnosed myself with misophonia (a VERY REAL kind of rage some people get with certain sounds - like the ones my sister made while eating) so I basically spent most of my childhood trying not to stab her with a fork at the dinner table. But before I finish that endearing little tale, let's check in: how was yesterday?? Were you able to take a few moments while eating to get present? A few breaths? A few CHEWS? Again, let's not gloss over the tiny victories. Every step in this direction is a step away from diet culture. And for that, you deserve a medal. A chocolate one. Okay, so there is no important moral to my boring story above. I was just kind of a jerk that hated eating noises and my sister understood the importance of the PLEASURE of eating. I work with so many women, caught in the obsession to be thin and perceived as super healthy, that they spend their lives forcing down boiled chicken, steamed broccoli, protein shakes, and bars. And then they can't figure out why their appetite and cravings are out of control. Why they've lost their zest for food (and often other things in life!). A true intuitive eater understands that food is NEVER just fuel. The emotional, pleasure-filled joys you can derive from food are just as valid as your nutrient requirements...sometimes even more so. There have been so many studies (think The Blue Zone research, The Roseto Effect, etc) into communities that live long, healthy lives...and even more important that WHAT people in these areas are eating is HOW they eat. The social, connected, pleasure filled way in which they eat appears to have a pretty strong effect. It has also been documented that micro-nutrients (like iron) are absorbed up to 50% MORE from a pleasurable, deeply enjoyed meal. This is not to say that wholesome, unprocessed foods are not important. Of course they are! It's just to reduce the hyper-focus typically placed on what we should be eating......To get away from the obsessive, reductionistic approach so many experts currently take with regards to our nutritional requirements and start to recognize that health is a deeply complex thing. Let's bring the focus back to pleasure. Make ALL of your meals today exceptionally pleasurable. Think about what it is you most want to eat and do your best to make it happen. Try to eat somewhere beautiful: a well-set table, your bed, a park, by the water, your front step....wherever. Light a candle. Put on some music. Have a glass or wine (maybe not for breakfast) or some lemon water. See how you change, how your appetite changes, how your mood changes, when you eat pleasurably. One little thing: I feel the need to mention that eating pleasurably doesn't mean eating junk food. I often ask myself: what food would be MOST pleasurable right now - and the answer is usually "a really good Greek salad with chicken" or "roast potatoes with rosemary".....but that can happen but I am equally open to the answer being "chocolate mousse". And if the answer is, indeed, chocolate mousse than I do my best to get it and eat. Because I've made peace with food, all foods are neutral and equally acceptable. Junk food doesn't have extra power/pull so it doesn't call out to me as often as you'd think.....but when it does call, I listen. And I enjoy every minute of it!!! But first, how was yesterday? Did you eat something pleasurable? Did your brain explode? Did your waistband?? My hope is that the answer is YESSSS! and then NOOOOO! That you can get a tiny glimpse into a world where delicious, incredible food is the norm. Because life is too short to eat rubbery low fat mozarella. #tweetit! 1. Emotional eating is normal. In Linda Bacon's book: Health at Every Size she highlights the fact that even unrestrained eaters (people who don't diet, never have, aren't trying to control their weight) eat emotionally. As mentioned in the previous post on pleasure: Emotional eating is a valid part of the eating experience. That said, it has been found that those in diet mentality (the mentality ruled by all of those black/white, good/bad, rule-y thoughts I've been trying to get you to dump) emotionally eat much more often that those who don't diet. 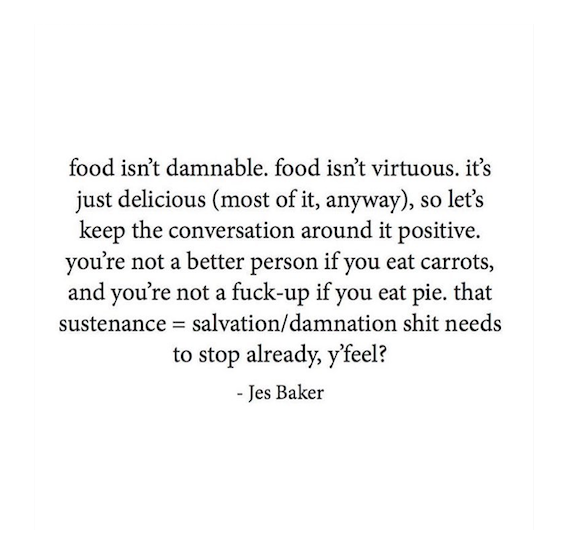 This is a big, important concept to grasp, if you want to end your addiction to numbing out with food. It's not clear why the correlation exists but I think it makes sense that, if you spend your entire day thinking about food and stressing about food, you create tension in your body and brain. And then, when the tension becomes too much - because of the multiple stressors in your life - food becomes the pressure valve that blows. This is to say that ALLLL that other work we've been doing: making peace with food, rejecting diet mentality, hushing up the food police, etc are all important steps to reducing emotional eating. I've said it in a previous email but I'll say it again: food really can, very effectively, take you from a state of stress into a state of relaxation - eat enough and you'll get there. There are consequences, sure, but that doesn't stop food from being a fast, cheap, readily available and effective sedative. If you want to reduce your emotional eating you are going to have to build new coping mechanisms.....and that's going to take time. It's not something that happens over night and you aren't going to be able to stop resorting to food as a tool until you have other, stronger - equally compelling - tools in your tool belt. 1. Understand that getting out of diet mentality (that encourages and amplifies emotional eating) is really getting to the root of the problem. Keep working the tools from days 1-6. 2. Start to build new coping mechanisms....WHILE YOU CONTINUE TO EAT EMOTIONALLY. It's the only way. If you think you can simply replace an old and trusted way of coping (i.e. cookies) with something new (i.e a hot bath or meditation) while in the midst of difficult emotions or stress, you are in for unpleasant surprise. We humans don't like to change that easily. Instead, I want you to think about DIVERSIFYING your coping mechanisms - so the next time you find yourself using food to manage feelings, add on a new coping technique - eat the cookies AND have a hot bath, eat the cookies AND got for a walk and get some fresh air, eat the cookies AND meditate - hell, eat the cookies while meditating. I don't care. The main thing here is to start to slowly build the muscle of "coping without food". And then, as you work to leave diet mentality behind, and this new muscle grows, you will soon find you can cope with difficult moments without cookies (or with FEWER cookies).